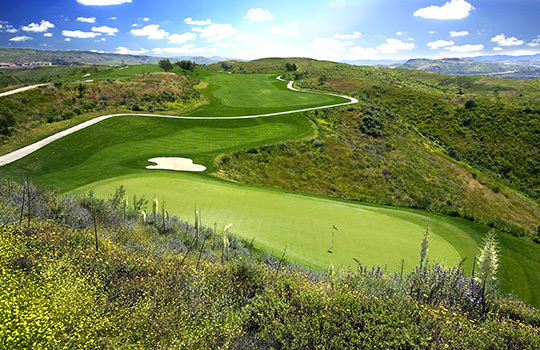 With Spectacular panoramic views including glimpses of the Channel Islands the wonderful coastal temperatures give Moorpark Country Club the perfect year-round climate for golf. 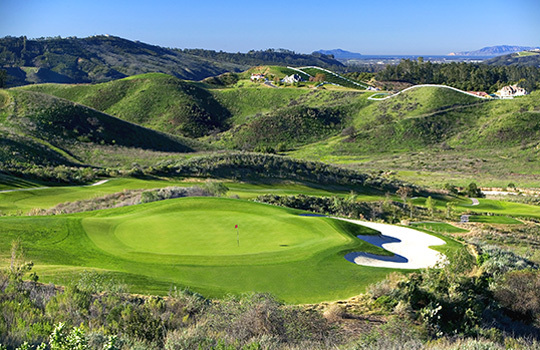 “Inspiring golf is great golf, see for yourself” states Peter Jacobsen as he comments on the 27 holes of world-class golf at Moorpark Country Club. The opening hole is a slight dogleg to the right that plays downhill off of the tee and uphill on the approach. To the right of the hole are slopes that drop off to the valley below. 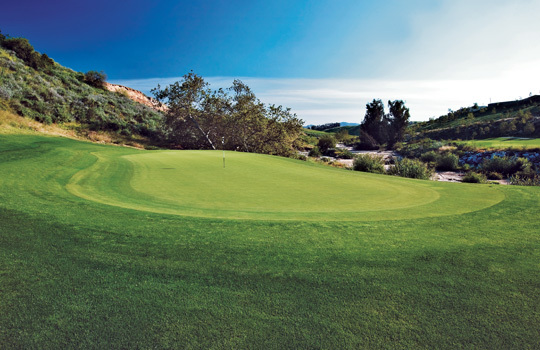 The green is guarded on the right by a steep grassy face that must be carried to reach the back right pin position. The safe entrance to this green is from the left. There are beautiful views of the valley off to the right side of this hole. Epworth was the birthplace of John Wesley and the original town here was named Epworth. On the corner of Grimes Canyon and Broadway the original schoolhouse and post office still stand. The second hole is a straight-a-way, par 4. The entire left side of the hole is protected by a series of grassy hollows, while strategically placed trees protect the right side. A good drive will create a chance to get ahead in the round with a good approach into an unguarded green. You must hit two straight shots or this hole could be trouble. Be sure to look over your shoulder from the green; on clear days you can catch a glimpse of the Channel Islands and the Pacific Ocean. The downhill third hole will be a test of accuracy off of the tee and into the green. Take your tee shot down the right hand side of the fairway. Only really long hitters will have a chance to go for the green in two. Otherwise, you must lay up to a canyon short of the green. The shallow but wide green is perched on a mountainside ledge. Shots to the green must carry the canyon with a deep pot bunker and native area protecting short of the green. What ever you do, don't be short! 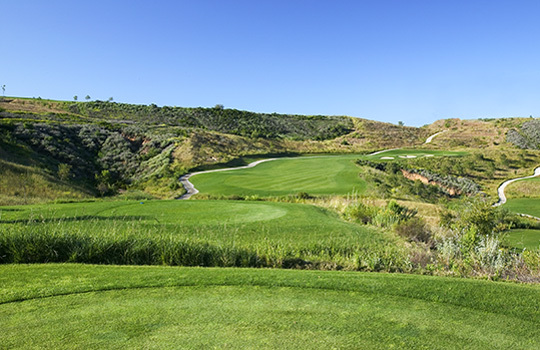 A beautiful, downhill, par 3 that plays differently depending on the tee you are playing. 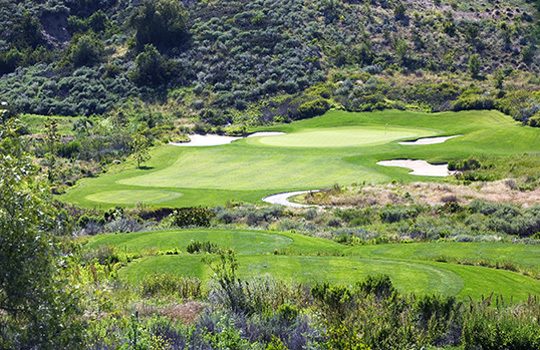 The â€œBig Jakesâ€ and Championship tees require an accurate shot over a canyon covered in native vegetation into a skinny, but long, green protected by a deep bunker on the right. From the two forward tees it is a 40 ft. drop down a slope into a wide, but shallow green protected by a bunker in the back. Either way, it is a challenging test of accuracy! This area of ranches was called â€œFairviewâ€ over 100 years ago. They would say "You have a fair view of the ocean from here". 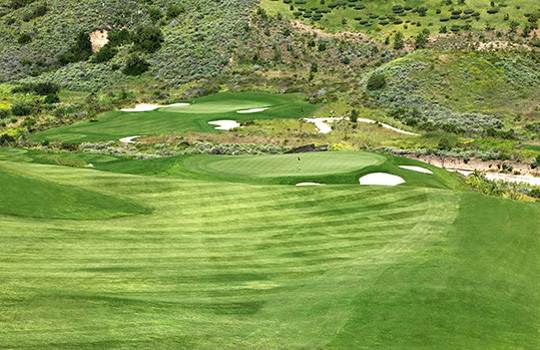 A long, downhill, par 5 that drops 170 feet from tee to green down to the arroyo that runs through the middle of the property (one of the longest par 5's in the United States). Avoid right on the drive and second shot. It will take two accurate strokes played down the left side of the fairway to be in good position for the approach into a heavily bunkered green. Dramatic views all the way down the entire hole. 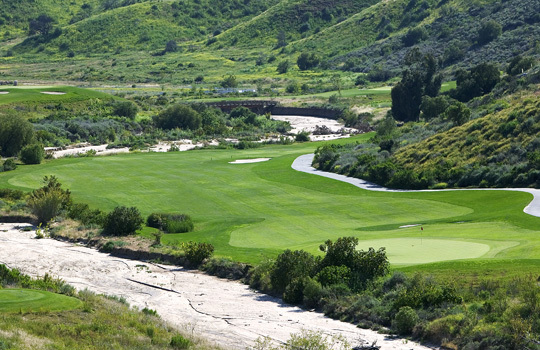 A long par 3 that plays across the arroyo into a green with bunkers short right and long left. 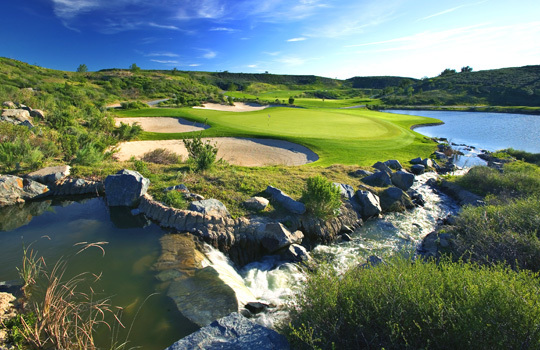 A natural setting of the river valley and the native grasses make this a beautiful hole. Don't hook left or you will be OB and might rustle up some angry cowboys! 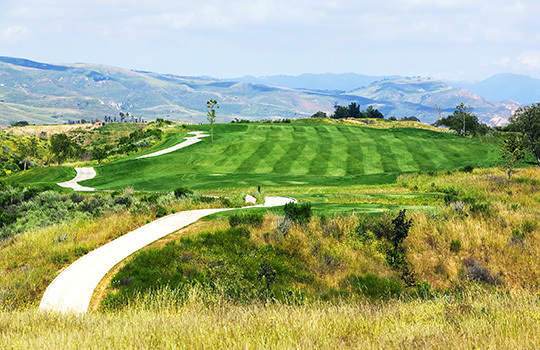 A dogleg left that sweeps around the base of the hill on the left and protected by the Gavert Wash down the right side. After a well placed drive, reaching this green in two requires a gamble of carrying the deep bunker 30 yards short of the green on left side of the fairway. If successful, the player will be rewarded with a kick off of the down slope behind this bunker carrying the ball onto the green. However, if unsuccessful your problems are only beginning. The drive probably played with a fairway wood or long iron, on this short par 4 is a placement shot. Play it at, but just short of, the fairway bunkers. This will leave a short iron shot over the arroyo to a shallow green. Second shot must be distant accurate! The smart play on this par 3 is to work the ball from right to left into this large but well-guarded green. 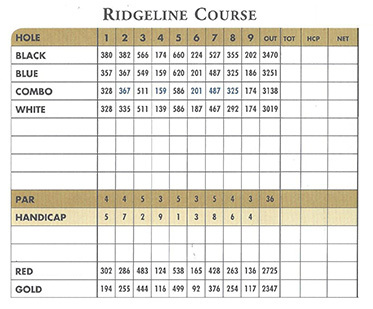 The lake short and left, water fall back and left, and the bunkers long make this a difficult finish to the front nine. The 'Ogo Pogo' is the Canadian cousin to the Lock Ness Monster. Don't let this bogey monster get you!